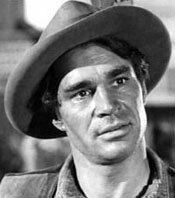 Rugged appearing, the educated John Milford was ideal for arrogant, sarcastic badman roles on TV, however seldom rose to the position of top-billed guest star, remaining usually as one of the gang. Born September 7, 1929, in Johnstown, New York, he received a bachelor’s degree in civil engineering at Union College in Schenectady, New York, and a master’s degree in drama at Yale. Milford made his acting debut on the early TV series “What’s My Name?” at KGRB in Albany, New York, and his film debut in “Marty” in ‘55. 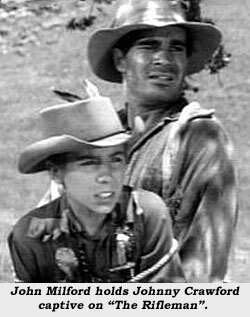 Over the years he had recurring famous-outlaw roles on two series. He was Ike Clanton on “Wyatt Earp” from ‘59-‘60 (recast with Rayford Barnes ‘60-‘61) and Cole Younger on the short-lived “Legend of Jesse James” (‘65). Milford also had regular non-western roles on “The Lieutenant” (‘63-‘64) and “Enos” (‘80-‘81). 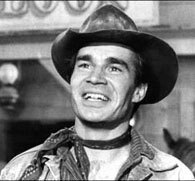 Perhaps “The Rifleman” made best use of Milford’s talents, employing him 11 times over its five season run. Just a few of the dozens of other TV Westerns Milford appeared on between ‘58 and ‘70… “Mackenzie’s Raiders”, “Wanted Dead or Alive”, “Tales of Wells Fargo”, “Texan”, “Bonanza”, “Sugarfoot”, “Have Gun Will Travel”, “Outlaws”, “Cheyenne”, “Laramie”, “Virginian”, “Gunsmoke”, “Big Valley”, “High Chaparral” and so many more. In later years, Milford was a member of the so-called Johnny Carson Players, playing Leonid Brezhnev to Carson’s Ronald Reagan in late night skits. When acting didn’t pay the bills, Milford went back to civil engineering for which he’d been schooled. In that capacity he created the original design for the Hollywood Walk of Fame which now has over 2,000 engraved bronze stars. But Milford may be best remembered for what he did for the theatre business in Los Angeles. In 1957, he helped build a venue at 3759 Cahuenga Blvd., once known as the REP Playhouse, then Studio Theatre. In 1969, with partners, it was changed to the 45 seat Chamber, the first of the city’s equity waiver theatres. The little theatre helped launch the careers of such actors as Richard Chamberlain and Vic Morrow. At 72, Milford collapsed and died August 14, 2000, en route to his Brentwood, California, home following outpatient care for skin cancer at the John Wayne Cancer Institute in Santa Monica. He’d recently appeared on “Melrose Place” and “Chicken Soup For the Soul”. He was married to film and TV producer Susan Graw for many years.